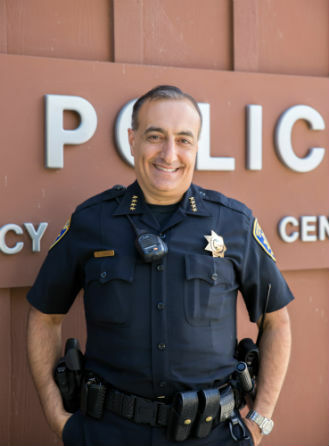 The UC Santa Cruz Police Department is committed to actively engaging in a comprehensive Community Oriented Policing strategy, adopting service to the community as the overarching philosophy of the organization. As such, we have dramatically increased our crime prevention and outreach efforts to provide more ways for the campus community to interact with us than ever before. In addition to our Citizen Police Academy, our revamped website, on-going crime prevention presentations, outreach and marketing events, community forums, and personal interaction with members of the community, we are continually seeking opportunities, and exploring new programs and projects to engage in open and frank dialogue to improve our operations so that we may maintain a safe working and educational environment, while becoming a better resource to the community. No matter what brings you to our beautiful campus, the UC Santa Cruz Police Department is here to protect and enhance the safety and well being of our community. We encourage each and every one of you to act in partnership with the Police Department to address crime and quality of life issues, as well as increase the public’s understanding of law enforcement. 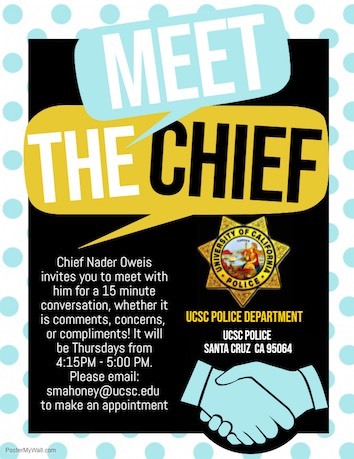 On behalf of the men and women of the UC Santa Cruz Police Department, we are very honored to serve you!